Celtic FC supporters raised Palestinian flags on May 13 during a match against Scottish Premiership rivals Heart of Midlothian FC. 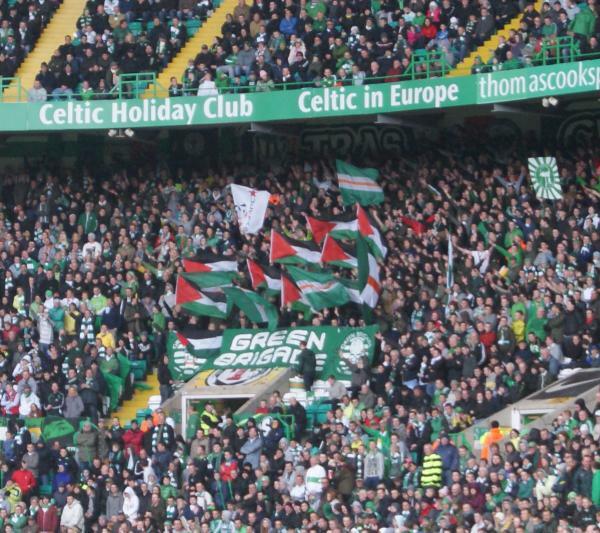 Members of the Green Brigade, one of Celtic’s most widely recognized fan groups, displayed at least eight Palestinian flags in their section of the stadium in solidarity with the thousands of Palestinian hunger strikers currently imprisoned in Israeli jails. It should be no surprise that politics made its way into the stadium. Especially within Europe’s various football leagues, politics and sports mix quite regularly. It is, however, both an interesting and a welcome gesture to see the great Palestinian prisoner hunger strike receive attention beyond the traditional sphere of politics. This Monday, between 2,000 and 2,500 Palestinian prisoners will be entering their 28th day on hunger strike. Bilal Diab and Thaer Halahleh will both be entering their 77th day, each demanding an end to Israel’s practice of detaining Palestinians without charge. The prisoners and their supporters have released an updated list of demands which can be found here: ‘A Situation Room on the Issue of the Mass Hunger Strike‘.